Violins – made in China | LEARN TO PLAY THE VIOLIN FOR FREE! China now makes 70% of the world’s violins. And the quality at the top-end is quite good. In fact, it’s making Italian violin makers nervous. The World’s, Mary Kay Magistad checks out China’s violins. Magistad: Zhang admits that the initial quality of the violins made here was marginal. But she says it has improved quickly, and now the town of Donggaocun alone – population 30,00 — provides one-third of the world’s new violins. That’s about 300,000 a year. There are a couple dozen violin factories here in Donggaocun, but one monster – Huadong. It makes most of Donggaocun’s violins, and markets them globally under the brand Huayun. Geng: “I think the quality and also the skills of our workers are improving fast, and I think the quality of the violins we make here will be better and better. 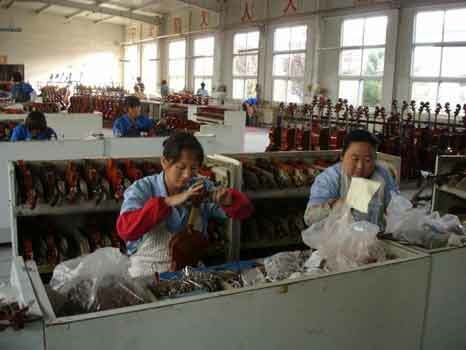 Magistad: Geng says the factory regularly invites in master craftsmen, and holds competitions among the factory’s violin-makers. She says each is trained for up to a year, to become competent at making one violin part. The different parts are then assembled here at the factory. That system works well for low to mid-quality violins – and China’s violin industry now dominates the market in that range. Magistad: Zheng Quan says, he’s impressed with what he’s seeing so far. Magistad: Zheng Quan is referring to the old style of education where a student worked with a master, and learned his craft through oral tradition from that one person. Now, he says, there’s a wealth of information and many technical advances to draw from. But the old style, of learning from the master, is clearly still alive between Zheng Quan and his students. One comes in while we’re talking, to ask for help with her cello. It’s sounding off. 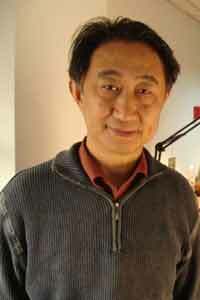 Magistad: Zheng listens, takes the instrument and makes a swift adjustment to the wood, tapping lightly with a tool. Then he listens again – much better. Zheng Quan himself has been playing violin since he was 5 – except for the years, during the Cultural Revolution, when his family was punished for being bourgeois, because his father had owned a factory. Magistad: Which was a bit ironic since Mao Zedong used to call the violin a revolutionary instrument – one that was used to play the 8 revolutionary operas – the only ones allowed to be performed during the Cultural Revolution. Many kids learned to play the violin, to avoid being sent to work in the countryside – as Zheng Quan was. Magistad: And eventually, he met a master violin-maker, and set the course of his life. Now, as a professor at the Chinese Conservatory of Music, Zheng Quan says he makes sure his violin-making students also learn how to play. Magistad: At the high school attached to the Chinese Conservatory of Music, a select group of teenagers are learning to do just that. 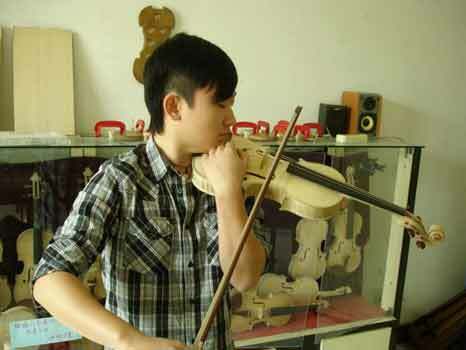 It is the only high school in China that teaches the fundamentals of violin-making – so the students have a good base of knowledge when they move on to study at the Conservatory under Zheng Quan. The students saw and shave and sculpt spruce for the front of the violin, maple for the back, and sheep’s gut for the strings. It takes them about a year to make their first violin. A lanky 18-year-old in black jeans and a pop star haircut, Chen Kemeng, is now starting his fourth. Magistad: He says he hopes in the future to be both a concert violinist and a master violin-maker When I ask what happened to the other violins he’s made, he pulls out one that he crafted, start to finish, cradles it under his chin, and draws the bow. It’s a moment so poignant it stops time, a glimpse of the passion and potential of China’s next generation of master violin-makers. For The World, I’m Mary Kay Magistad in Beijing. via Violins – made in China | PRI’s The World.